Posted on March 13, 2014, in Uncategorized and tagged #thismummysays, Doodlemum, Humour, Illustration, Life, Pen and Ink, Sketchbook. Bookmark the permalink. 6 Comments. That’s the biggest laundry bin I’ve ever seen. Don’t fall in! It’s more of a laundry mountain – too high even for Arnie to climb! My sister Steph used to fling all her dirty washing into a pile in the corner of her room, and every now and then, would fish something out of this festering heap, and wear it! Maybe a modified approach could be taken – fishing out all the things that have been worn for 10 minutes only, and any “one use” towels? 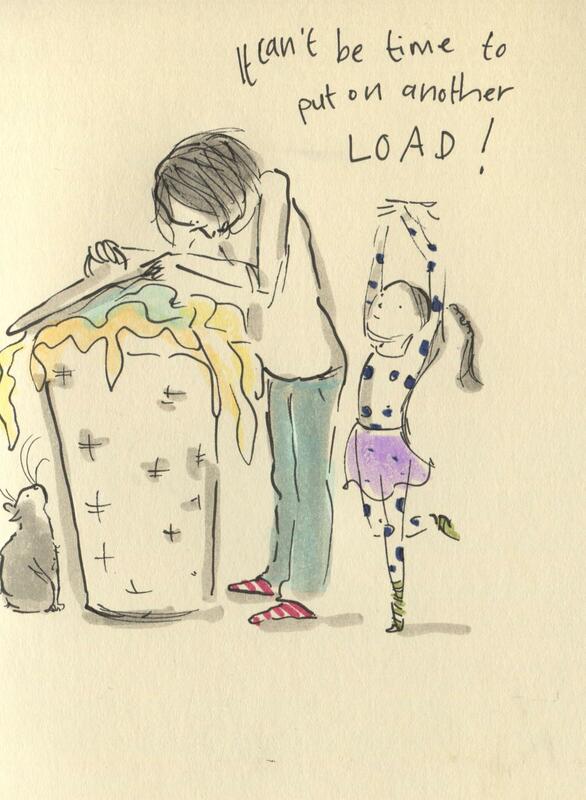 I love Evie’s spotty ballerina outfit and wonderful pirouette pose- a much lovelier sight than a laundry pile! Truth!!! And one sock ALWAYS gets lost!! I have no small children at home, and yet my laundry basket is exactly the same!